For too long I’ve been away from my much loved books as life snuck up and carried me away in other directions. 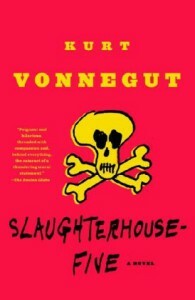 Anxious to get back to reading again I decided the first book to tackle would have to be from the 1001 Books to Reads Before you Die list and who could be better than Vonnegut to ease me back into literature. In this slim volume he has managed to convey the horrors of war and the lasting damage to those affected by it. With an economy of words and his trademark blend of science fiction and black humor we are introduced to Billy Pilgrim, a tall skinny optometrist as he recalls his war time experiences as a prisoner of war during the firebombing of Dresden. Through his time travel, made possible by his abduction by the aliens from the planet Tralfamadore, we make multiple jumps from the present, back to the war, to his childhood, early adulthood, then back to the present again. Without any preaching we are shown how unnecessary and horrible war is for everyone except certain elites who gain financially or politically from the misery of the soldiers who have to fight in one and the civilians who are helplessly caught up in the death and destruction brought to them. Billy’s non-linear narration makes for loosely connected events that are discomforting and confusing at times and by all rights shouldn’t work, but it does, and it works well! Once started I couldn’t put it down until the last word on the last page was finished. Excellent read that I happily recommend!